Until now, art has been Apple’s forte. It seems you can’t walk into a design studio without facing iMac after iMac. This extends to more than just desktop spaces, of course. Apple has long been the top contender for everything technologically chic, sleek, and different. From its phones to its proprietary software, why bother looking to any Windows PC when Mac seems to be the name of the game? That is, until Microsoft released the Surface family. A new name in sleek design and creative facility, the Surface family is throwing serious heat to even the most devout Mac users. 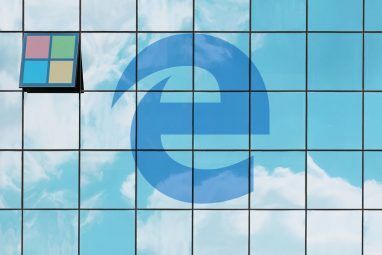 It seems now more than ever, Microsoft is combining its past operating system (OS) and hardware attempts into a user-friendly PC family. Plus, it seems Microsoft is directing its Surface family towards the more creative users out there. Make no mistake: these two desktop behemoths will meet your needs regardless of purpose or preference. There is, however, a distinct purpose for the Surface Studio. With the added news concerning the Windows Creators Update A Peek Into the Windows 10 Creators Update A Peek Into the Windows 10 Creators Update Microsoft just announced the next major Windows 10 upgrade. The Creators Update will come to 400 million users in Spring 2017. Here are the highlights of Wednesday's Windows 10 event. Read More , it seems Microsoft is aiming their OS specifically at designers. This includes adding functionality which was otherwise absent in Windows machines. A few advents include updated Paint software, enhanced 3D modeling capabilities, beefed up touch-screen hardware, and several other added capabilities. With these added capabilities, there’s a chance Windows will enter a territory otherwise not ventured: graphic design and illustration. That’s not to say Windows wasn’t equipped to handle graphic design before, since most design software works for both Windows and Mac. Now Microsoft has a chance to conquer the sleek, stylish, and design-oriented crowd with their official Surface family. The two contenders for desktop environments are the iMac and the Surface Studio. Apple has long marketed its iMacs to two distinct classes of users: designers and Apple enthusiasts. The reason for this? 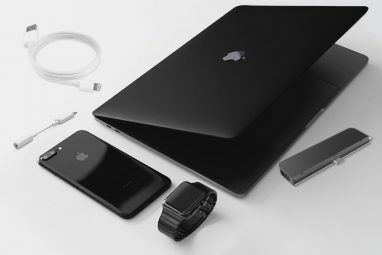 Apple has long been the top choice for important features like advanced font rendering and excellent proprietary software The Best Mac Apps to Install on Your MacBook or iMac The Best Mac Apps to Install on Your MacBook or iMac Looking for the best apps for your MacBook or iMac? Here's our comprehensive list of the best apps for macOS. Read More . Windows computers, on the other hand, have long been the jack of all trades, master of none choice for users. With such a wide selection of software and hardware, strewn between phones, tablets, laptops, and desktop PCs, Windows has always been a confusing choice. 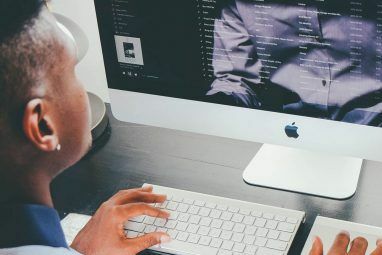 While in the past, Windows machines have come from a range of third-party manufacturers and in all kinds of form factors, Macs have always consisted of a distinct, and optimized, range of devices. Cue the Surface Studio, Microsoft’s answer to the design studio. Displays are a big deal for both iMacs and the Surface Studio. So much so, that Apple separates its existing iMacs according to screen resolution: the 21.5-inch iMac with Retina 4K display and 27-inch iMac with Retina 5K display. To contrast, the Surface Studio is only available in a 28-inch PixelSense display capable of 63 percent above 4K resolution. The larger display isn’t only for looks, either. Unique to the Surface Studio is its complete touchscreen capabilities, doing away with such extraneous hardware as drawing tablets. That means the Surface Studio, standing at a whopping 23-1/2 by 15-1/2 inches, provides over 364 square inches of usable touchscreen space. This is a big plus for designers, since it provides such a large and multi-capable display. Don’t forget to sprinkle in the Studio’s color space feature either: in order to fit as much color variance in their display as possible, the Studio allows for sRGB, DCI-P3, and Vivid (P3-D65) Editing Digital Photos? Pick The Right Monitor & Configure It Properly Editing Digital Photos? Pick The Right Monitor & Configure It Properly Have you ever taken what you thought was a great photograph, only to find it looks dull when you view it on your PC? If so, your monitor may be letting you down. Read More color profiles. But it’s the touchscreen How to Fix Your Windows 10 Touchscreen Not Working How to Fix Your Windows 10 Touchscreen Not Working Is your Windows 10 touchscreen not working? Here's a troubleshooting guide to fix your touchscreen issues in Windows 10. Read More monitor that steals the show: the Studio supports its screen on a hinge which can bend backward to allow for easier drawing capabilities. With the ZGH (Zero Gravity Hinge), you can go from desktop to multi-touch drafting board in seconds. As trivial as that sounds, the ability to switch quickly from screen to drawing table is one of the most highly anticipated aspects of the Studio. This particular function also exemplifies the relationship users will have with the Surface Studio: up close and personal. The touch screen functionality, Surface pen, and new Dial tool, almost begs users to lay the display flat and use the Surface Studio as a second, interactive table. That should be no surprise, as Microsoft is also the creators of the interactive Surface Hub. To a certain extent, the Surface Studio adapts the best aspects of this wall-bound PC powerhouse into their smaller, more defined Surface Studio. There’s no other way to say it: the Surface Studio is expensive, even compared to the iMac. The least expensive Surface Studio PC clocks in at $2,999, while the most expensive, stock iMac listing will cost you $2,299. Apple also allows for a wide range of price points, while Microsoft only offers three configurations. The only Apple product coming close to that Studio’s range is the Mac Pro Who Really Needs A Mac Pro? Who Really Needs A Mac Pro? If you've thought of buying a Mac Pro, you may want to reconsider. Read More — Apple’s spin on the classic PC tower — which, although about two years old, still targets professional desktop users. There is some question as to whether Microsoft will go the way of Apple and provide various different, lower-end models of the all-in-one computer. The comparison below includes a specific configuration of the iMac 27-inch PC and the second-tier Surface Studio, both equaling a total of $3,499. To some, the hardware of the iMac comes second to its dependability and familiarity. To others, hardware is the only indicator of a PC that matters. How do the two compare? It’s difficult to compare the two outright, considering the iMac sells many variants within its general frame. Given the similar price point however, there are some clear differences, along with a few overwhelming similarities, between the two. What’s running these powerhouses? On the Studio’s side, a sixth-generation Intel quad-core i7 processor. This means the Studio CPU will take full advantage of Windows 10’s Skylake capabilities. Other Windows distributions will experience update and performance throttles after July 17, 2017. This isn’t too far off from the iMac’s specs as well, since at a similar price point you will also receive a 4.0 GHz quad-core Intel Core i7. Moreover, it’s important to note the equipped RAM modules Everything You Need to Know About RAM & Memory Management Everything You Need to Know About RAM & Memory Management RAM is your computer's short term memory. Hence, memory management has a significant impact on system performance. Here we explain how RAM works and whether you can do anything to increase its efficiency. Read More of each PC, which, along with the processor, provide the thrust of your PC’s performance. At the same price point, the Surface Studio comes equipped with 16 GB of RAM, and the iMac comes with double the RAM at a whopping 32 GB. While the performance gained by added RAM isn’t exactly two to one, a greater amount of RAM definitely assists with tasks things like video and image editing. At the exact same price point, the Surface Studio sports an NVIDIA GeForce GTX 965M with 2 GB video memory, while the iMac comes standard with the AMD Radeon R9 M395X with 4 GB video memory. In this instance, the iMac wins over the Studio in clock rate and video memory. That said, neither of these graphics cards equips these machines to play at both their native resolutions and at max visual settings. These are not distinctly gaming systems, and shouldn’t be considered as much. However, both graphics cards should render 3D video as well as 3D drawings How Microsoft Is Pushing the 3D Revolution With Windows 10 How Microsoft Is Pushing the 3D Revolution With Windows 10 3D is coming, and Microsoft has gone all in; 3D scanning, editing, presenting, and desktop environments are within reach in the upcoming Windows 10 Update. We show you what you can expect. Read More quickly and easily. While there are numerous differences between the Surface Keyboard and Mouse on the Studio’s side and the Magic Mouse 2 and Magic Keyboard on the iMac’s, this article will focus on designer tools. Both the Studio’s and the iMac’s mouse and keyboard suit their purposes optimally. Having the Surface Pen included in your purchase sends a clear message to the user to use this PC as something of a large tablet. A unique peripheral to come standard with the Surface Studio, it’s a bold move considering you can use the Surface similarly to a drawing tablet straight out of the box. Its form factor also allows for optimal ease of use. The Surface Pen has a flat, magnetic edge so users can easily tack on the pen to the edge of their Surface Studio display. A rubberized part of that edge hides a button, as does the top of the pen, for use with aptly optimized software. The Pen is not without its issues. Although the Surface Pen supports important functions like pressure sensitivity, it is subject to issues such as jittering. The pen will actually mark the display before the tip touches its surface. This may cause headaches to artists who require very precise strokes from their digital drawing tools. In other words: it’s no Wacom, but it’ll work very well. While it may not become the new industry standard out the gate, the combination of Surface Pen and Surface Studio allows for complete drawing tablet functionality — straight out the box. Microsoft’s newest input device is… odd. A dial capable of adjusting settings when in direct contact with the screen, this new piece of technology is meant to ease the process of enabling different setting configurations. Whether it be adjusting brightness, sound, or brush width, the Dial provides a lot of use in its little package. Its functionality is as expansive or as limited as compatible software allows, and only a few applications are optimized to deal with the Dial’s unprecedented functionality. The Dial’s principle audience is graphic designers: the Dial will provide secondary control while using the Pen to draw and sketch. Note that the Surface Dial, though a major player in Surface Studio advertising, is sold separately. The Surface Dial costs $100. Apple’s newest trackpad, on the surface, only seems like a larger and sleeker version of the original Magic Trackpad. Inside, however, there is a special motor which provides haptic feedback very similar to mouse clicking even though nothing actually clicks within the trackpad. The Magic Trackpad 2 also provides a feature named Force Touch which, similar to pressure sensitivity, gauges the pressure of your touch. This may be used with for simple tasks like brightness and sound. Best of all, it’s very familiar as the mechanics in the Magic Trackpad 2 Why OS X Works Better with a Trackpad Why OS X Works Better with a Trackpad While Microsoft has focused on bringing touchscreen technology to the desktop, Apple has continued to optimize for the more traditional pointer-based approach. Read More are identical to those found in the MacBook’s trackpad. Much like the Dial, it’s a simple and elegant standalone device which allows for easier multitasking and extended setting configuration. It is also only available separately, at a cost of $129 ($50 when bundled with iMac). Microsoft’s move to become the new face of creative users extends to more than their Surface Studio. Indeed it seems the Surface family — a new Microsoft endeavor to create a Windows line — is attempting to compete directly with customers. Don’t believe me? Head on over to the Surface website and check out Microsoft’s official Compare to Mac feature for yourself. The Surface Book certainly does compare to the Mac in hardware and display, but form factor is where the Book reigns supreme. In textbook Microsoft fashion, the Surface Book has packed in most of its hardware in the screen. This allows for the Book’s most notable feature: a detachable screen with can act as an independent tablet. Similar to the Surface Studio’s functionality, this is meant to have users draw, paint, sketch, and edit their artistic works. For those who have been keeping up with Microsoft’s efforts these past few years, it seems their main point of focus is blurring the lines between static and dynamic PC use: over time, laptops will become less clunky and more interactive via screen, camera, and so on. On the other hand, Apple is also seeking to reinvent their flagship laptop, the MacBook Pro, with new functionality as well. Just recently, Apple announced their new Touch Bar and Touch ID feature. The Touch Bar How to Get the New Touch Bar on an Old MacBook for Free How to Get the New Touch Bar on an Old MacBook for Free Want to try out the pricey new MacBook's Touch Bar for free? There's an app (or two) for that. Read More promises to ease the process of editing in several programs, such as video and audio editing software. More importantly, it shows a move on behalf of Apple to make the MacBook experience more touch integrated. It seems both of these tech behemoths are trying to convey one thing: a fuller, more touch integrated interface is the future of PC design. You have good reason to question a comparison between Apple’s de facto design PC and Microsoft’s new kid on the block. After all, this is a big step for Microsoft. In all fairness, we can’t claim that the Surface Studio is a direct contender to the Apple iMac. Although both are all-in-one desktop PCs, several aspects including price, hardware, and purpose limit the comparison. That said, the basic similarities in both form and function are unavoidable, especially considering they both appeal to one subject in one way or another: design. Although not exactly hardware titans, and not cut out for 4K 60 FPS gaming, they do compliment each other. The iMac series has been tried, tested, and continually perfected to fit the capabilities of its formats. The Surface series, on the other hand, is new in terms of form factor and functionality. It’s not a question of better or worse. It’s a question of ability. It’s not so much what’s inside these PCs, but what they manage to do with their hardware, that creates such a distinction between these two tech giants. Microsoft is certainly making strides in trying to ingrain different features, form factor abilities, peripherals, and OS functions into the folds. In a sense, they are trying to change the relationship between a PC and its user. Apple, on the other hand, is taking the slow and steady approach. Mac is sort of a sit-down experience … And, of course, over the years we’ve experimented with all the technology, but we found it just wasn’t good … We’re not all that interested in building one. Microsoft, on the other hand, has gone all out with their touch screen interfaces. This allows beginner and professional graphic designers and illustrators alike the ability to do away with expensive drawing tablets, at least, for personal use. Moreover, both the hinge feature of the Surface Studio and the detachable feature of the Surface Book not only allow, but invite, users to take advantage of this closer relationship between them and their PC. While Apple is often the default desktop and laptop choice for designers, and has been for years, there’s no question Microsoft is encroaching on their territory with the sleek and innovative Surface family. 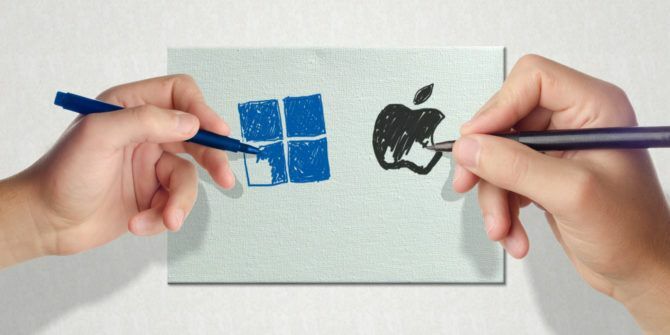 The choice between Apple and Microsoft is as much a point of contention as anything else. Ultimately, it boils down to the user. One thing is sure: both Microsoft and Apple certainly work hard to improve their offerings in order to meet the demands of the future. If you’re a designer, or aspire to be, which PC would you end up choosing? Let us know in the comments below! Explore more about: Apple, Design, MacBook, Microsoft, Microsoft Surface. I would definetly go for microsoft..